“I wouldn’t want to be cycling in this. Are you not freezing?” The woman at the reception of the Forbes Arms Hotel in Bridge of Alford looked at me like I was mad. I was going to say more about how I had just experienced one of the most spectacular bike rides of my life, but I was never going to be able to convey that to a non-cyclist; particularly when white flakes were swirling around outside and it was nice and toasty inside. I headed to my room to reflect on my day of Aberdeenshire adventure. The most magical moment had occurred on a road between Monymusk and Keig. The snow had started falling. It was getting dark. There was nowhere to shelter. I still had several more miles to go. I should have been worried. But I wasn’t worried. I was smiling. This was a fairytale winter wonderland. It was like I had stepped through the closet in the Lion, the Witch and the Wardrobe. The flakes were perfect, like those of childhood imagination. I felt slightly vulnerable because I was out of my comfort zone- normally I would be inside having dinner at this time. But it was adventurous and exciting. It was a pleasant cocktail of feelings. I did not feel cold, despite the snow. In fact, I was cosy and warm. I wished that I could cycle in this forever. I did not want it to end. If I had a tent I could have quite happily pitched up and enjoyed this spellbinding white land for the night. I would have been very happy. I had no desire to be inside a hotel room. The setting sun was exploding through a corner of the snow clouds. It put a yellow glow on top of a strand of trees on a distant hill where everything else was getting dark. The only sound was the gentle movement of the river. There was nobody else around and only one car passed me the entire time. When I planned this journey I could never have imagined that this road would turn out to be so special. On the map it was a narrow white line following the course of the River Don. It was away from the major carriageways; it served no large towns and was surrounded by a mass of nothing. It was simply a link in the chain of roads leading to my destination, but it turned out to provide one of my happiest bicycling moments. Curiously the road has a name, which adds to the mystique of this place and ensures I will never forget it. The Lord’s Throat. I am not sure what to make of that name. It does not have pleasant connotations, but it has a Tolkien quality that seems appropriate for my wintry adventure. This day had began with a train that I could not get on. I wheeled my bike up to the doors of the 8.21 Aberdeen to Inverurie 2-coach diesel and was met with a wall of people. They were packed in like a London tube train. No way was I going to get on, so I had to do a walk of shame back to the concourse, past the carriages of peering faces. It forced me to come up with a plan B. I looked at the departure boards and spied a train to Dyce, due soon. This is the stop before Inverurie so I poured over my map and traced a route. It meant an extra ten miles of cycling, but I was game for it. Diversions can often result in pleasant surprises. In this case it was the Dyce Pictish Stones, something I would never have come across if my train journey had gone to plan. Not far from Dyce station I turned onto a minor road that had a sprinkling of fresh snow. My tyres whooshed and birds sang. Down below the River Don flowed smooth and gentle. The peace and solitude was blissful after the road with speedy lorries that I had just left behind. My footprints on the snowy path up to the ruined and roofless Chapel of Saint Fergus were the first of the day. I wondered how long it would be until another set of footprints joined mine. Inside, on either side of the doorway, are two standing stones. One of them has some sort of beast carved into it and dates from the 6th century. A shaft of sunlight was almost perfectly framing the strange creature. I whizzed to Inverurie on roads that were quiet, but had some tough uphills. The surroundings are generic farming country, but turned pretty by last night’s sprinkling of white magic. I arrived at Kinkell Church, another ruin with treasure inside. This location is less than romantic with farming machinery lying around and a paper mill nearby. I crept into the empty space and discovered an intricately carved grave slab of a knight. His hands are clasped peacefully, but he is ready for battle with pointed helmet, chain mail and sword. His nose is long and thick, but his body appears thin and delicate as if he was not quite cut out for a life of war. “What on earth is that?” I had arrived at Inverurie and something made me speak out loud. It was one of those occasions where I am cycling along a nondescript stretch of road then after rounding a corner something out of the ordinary comes into view. It was a huge mound of earth covered in grass. It is called the Bass, a relic from the ice age and made from bits of geology spat out by a glacier. It looked like a giant camel’s hump with the fawn grass taking on the role of the shaggy fur. There was once a castle on the top and a staircase spirals up the side so that I could get up there and see the view that warriors would have had. Big clumps of wet, freezing sleet began a diagonal attack and I could see nothing. I retreated to the partial shelter of a tree whilst miserable droplets found their way through the slats in my helmet. A rumbling stomach forced me back on the road to search for some nourishment. It was the best question I had heard all day. After diversions, extra cycling and cold sleet, I had arrived at the tea room of Castle Fraser to revive with home baking. Cakes with glistening icing were displayed on a red check table cloth whilst a grandfather clock ticked. Servant bells hung silently next to little signs with the name of the room where the Lord or Lady would have rang for attention. Exploring the interiors requires stair climbing inside the turrets which gives it the feel of a proper castle. There are some flourishes, like “peacock parlour”, so called because of the 1890s wallpaper that features peacocks and pineapples. But mainly I found Castle Fraser more homely than overwhelmingly grand, especially when I discovered a little window seat in a small turret. I loved this and could see myself sitting there each morning with my breakfast, the sun streaming in, and contemplating a visit to the walled garden to check on the herbaceous borders. The castle is a concoction of different turret styles. Some that would look more at home on a French chateau and others more definitely Scottish. My favourite of all the turrets is a little baby one clamped to the side of a larger one. Near the top it has lots and lots of tiny windows all the way around the circumference and a brass rooster weather vane as its crown. Inside there is a staircase that took me to the rooftop where the wood scent of the Great Hall fireplace lingered and I could peer down to the courtyard and out over trim lawns, rows of trees and a walled garden. The sun had come out strong and dried the tarmac. I was eager to get my feet pedaling again. I passed through Monymusk, with its village square and a style of cottage that I had not seen anywhere else in Scotland. They look proud with elegant flourishes- white lattice windows, doors with forged iron hinges and timber roof porches. The windows of Monymusk Arts Centre had been turned to gold ingots by the teatime sun. Then I came upon the legendary road sign- "Lord's Throat"- marking the beginning of a happy cycle ride that would linger in my memory forever. Inverurie is 25 minutes from Aberdeen by train. Dyce station is about 8 minutes from Aberdeen if you choose to cycle from Dyce to Inverurie. Aberdeen is around 2.5 hours from Edinburgh, or 7 to 8 hours from Aberdeen. From Inverurie to Bridge of Alford the distance is around 24.5 miles. Add around 13 miles if you start the route from Dyce and visit the Dyce Pictish stones. There are some hilly sections on the route, but nothing too strenuous. The roads are mainly B-roads which are mainly light on traffic, but this route is best tackled by cyclists who are confident in traffic. There are a couple of sections where vehicle activity is particularly heavy- entering Inverurie and the road leaving Dyce towards the Pictish stones- but these are both short lived. The Dyce Pictish Stones are free to visit and located a short distance from Dyce train station. 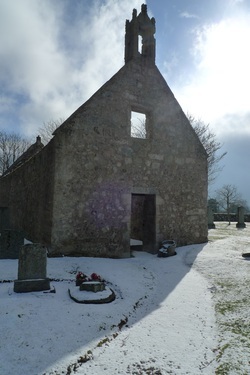 Kinkell Church is located just outside Inverurie. It is quite tricky to locate, so follow the instructions on the Undiscovered Scotland website. 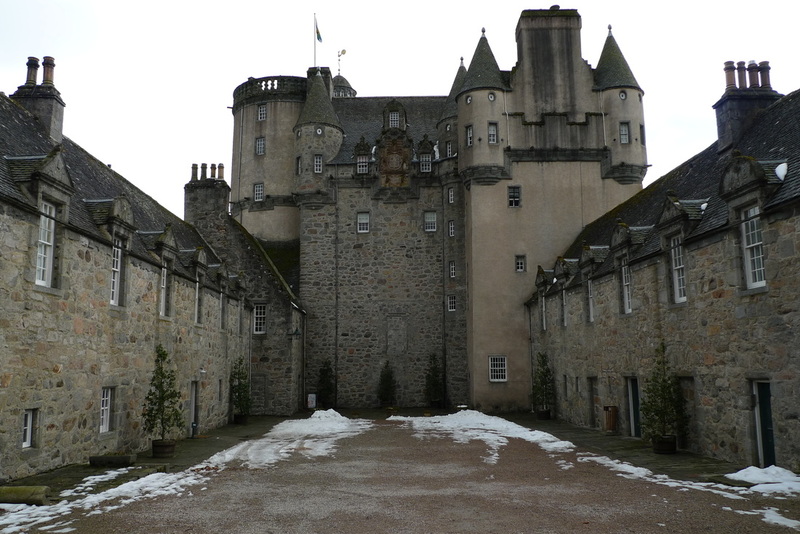 Castle Fraser has an entry fee. You could easily spend a whole day at the castle and its gardens. Castle Fraser has a tea room with the usual home baking, soups and sandwiches that you would expect from a National Trust Property. The hotel rests on the banks of the River Don with views of tranquil farming country. The actual Bridge of Alford is a sturdy granite affair and right next to the hotel. The conservatory dining area looks onto the river and the flow of water and birdsong will be your wake up call. The bedrooms are a little tired, the walls thin against noise from neighbouring rooms and the shower was quite weak. However, it is comfortable and as a base for a couple of days cycling it is perfectly adequate. The best thing about the hotel is the friendliness of the staff and I spent most evenings chatting with the owner about my day of cycling. The meals, filling and tasty, are classic pub food like macaroni cheese and fish n’ chips. There is a wood stove in the lounge which makes the place particularly cosy for an evening drink.